Here's a list of fish, from the rainbow-colored Variegated Platy to the blind Violet Goby, that begin with the letter "V."
Fish Names That Begin With the Letter "V"
Vampire Pleco - Leporacanthicus galaxias: Vampire Plecos are found living in the rapids of the lower Amazon in Brazil. Given their habitat in the wild, they need a similar strong current and high levels of oxygen in the aquarium. They also like to have lots of hiding spots and bogwood in the tank. This fish is usually friendly, but a crowd at the bottom of the aquarium can result in territorial clashes. Vampire Pleco gets along best with species that reside in mid-water or towards the surface. Variegated Platy - Xiphophorus variatus: The bright fish have are very popular among fishkeepers. They are calm and peaceful within a community, but they get on well with their own species too. You'll see Platies in every color (except purple) as well as black and white. You can have a whole rainbow of fish with just this one species. It's a great choice for beginners because they are hardy, active and breed easily. The Platy isn't particular about conditions either -- just keep the water is clean with appropriate chemistry and temperature, and Platies won't have any problems.The males stay small too, so they work well in small aquariums. Variegated Shark - Labeo variegatus: The variegated shark is native to the Congo river basin in the Democratic Republic of the Congo. It lives well in larger, well-maintained tanks if you give them lots of hiding places. The environment should also mimic a flowing river with a substrate of consisting of gravel, different sizes of rocks and a few large water-worn boulders. Use driftwood branches to construct crannies, nooks, and shaded spots. Keep in mind that they may damage plants with soft leaves. The variegated shark is a solitary fish and in the wild, it would likely only come in contact with its own species when spawning. Intraspecies aggression is significant and you may see a tank full of fish for sale with torn fins. This tendency only increases as the fish age, so it's generally best to keep them alone. It may be possible to keep them together in a large tank with many of hiding places, but each fish will need a diameter of at least a meter to call its own. 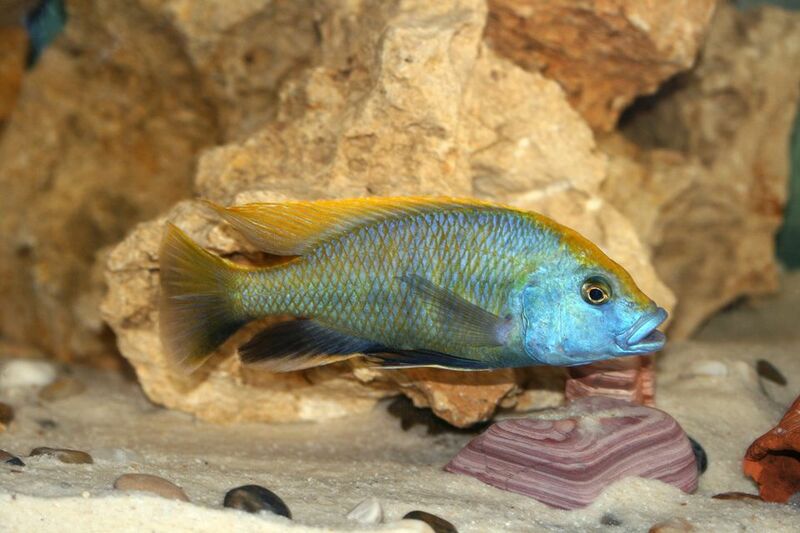 Venustus - Nimbochromis venusta: Its name means refined or elegant and the male cichlid has a blue face with yellow marks across the head and dorsal fin. The female is less colorful, sporting a dark blotched pattern on a silver background. The Venustus Cichlid needs a large aquarium with lots of hiding places, caves, and room to establish its territory. Use many pieces of stacked rock with a substrate made of a sandy aragonite which is necessary to maintain the requisite high pH and alkalinity. These fish are very sensitive to nitrate levels and require regular water changes to maintain good health. Violet Goby - Gobioides broussoneti: While the Violet Goby is sold as a very aggressive species given its fierce appearance, large mouth, and ample teeth, it is in fact quite gentle and nearly blind. If you feed it well fed, it usually won't bother smaller fish.